When the Ares liberation had finished, the newly created Condominium needed new places to settle. The Ares, without an operating colonization fleet, reached an agreement with the Sayx Corporation to use part of its fleet. This is how the cruise ship Wallenstein reached Tharken sector. Tharken 4 was the first choice, a planet capable of housing a large Sayx colony and a military Ares base, but more importantly, perfect to install a mining industry from which to expand into other planets in the system and start extracting Krithium. In a few years Tharken 4 grew quickly and began the prospecting tasks in the rest of planets with much more adverse conditions. Of all these ships, one was sent to Beta Tharken 17, the Valkyrie. Beta Tharken 17, also known as T17, was a sandy planet where there was no sign of life, but the Valkyrie was also not just a regular colony ship. Instead of having terraforming tools and modules forming civilian settlements, there were mining tools and Krythium containers. T17 certainly was not a fit place for life, but if the Wallenstein telemetry was not wrong, it was one of the largest deposits of Krythium ever found. The crew of the Valkyrie, 700 workers, 1,200 soldiers and 60 scientists from Sayx established a camp accompanied by three members of the Ares race, Alexander 03, Aerin 111 and Krieguer 214. Being a completely uninhabited planet and ignoring the advice of the Ares crew they didn’t set up a defensive perimeter… The rest happened very quickly. During the night and hiding under the sand almost two hundred of mechanical insectoid aspect creatures stormed the camp. Their attack was methodical and organized, first they finished with the most dangerous and armed individuals and then they finished with the workers. In less than three minutes T 17 again became a lifeless planet, but not inert. The small machines worked on the bodies of the fallen, incapacitating and reanimating them, some settled moorings in the flesh; others sneaked under the skin of the defenceless killed workers and anchored themselves to their backbone establishing connections with their spinal cord. While all this macabre surgery took place, two metal orbs approached floating the camp, scanning the massacred area and selecting the best prepared and least damaged bodies from the killed, that way they took 6 of the crew members and took them to the depth of the desert. 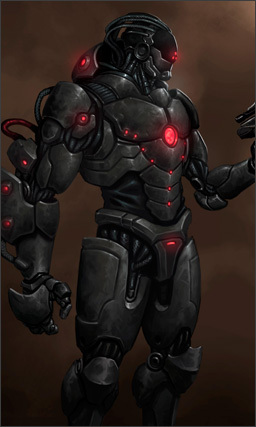 It had been five minutes since the beginning of the attack and some of the killed were already standing, with empty eyes and the parts that had lost their functionality during combat had been replaced by machines that performed the function of the lost limb or organ. It had been an hour since the beginning of the attack and about 1300 of the 2,000 passengers of the Valkyrie were before her and boarding. The ship took flight and headed toward the Wallenstein. During the journey, the Wallenstein tried to open communications with the mining ship, but got no response. When the Valkyrie was at radio distance, the Wallenstein tried to communicate again, as it was a standard procedure. From the cargo holds of the Valkyrie began to deploy thousands of mechanical insects. The laser drill of the Valkyrie designed to extract Krythium from the densest matters of the cosmos, took less than 4 seconds to open the doors from the hangar to the deck of the Wallenstein. The captain tried to warn the colonization ships of the Tharken sector. He died with this heroic gesture, believing he had alerted his brothers. Unfortunately for him he regained consciousness about a minute after that but being a mere spectator of the actions of his body and realizing that the signal had been blocked by the invaders. Moments later he saw a big flash and everything was silent again. Fifteen minutes after the start of the attack to the Wallenstein, the ships were deployed to all colonies of the Tharken sector and 4 mining ships descended to Tharken 17. The harvest has begun. After the contact at Tharken came the assault to the Earth. What or who is behind the Harvester remains a mystery. The only certainty with this race is that you have to eliminate them or join them in eternity. Jeff McKinley was a Sayx soldier assigned to the Tharken campaign. When the alarm went off, the second night after landing on the planet, he barely had time to run to the armory and rush to defend the perimeter of his assigned sector. Just seconds after leaving the facility a sudden shock left him unconscious on the floor. When he regained consciousness he discovered a devastating scene. 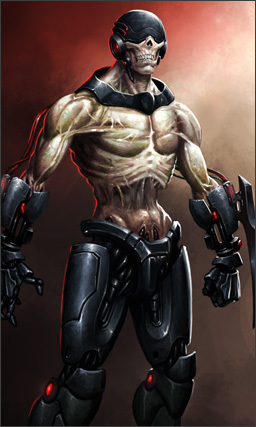 He was surrounded by a pile of corpses of his fellow soldiers while nightmarish creatures were searching for survivors. “Don’t move”, he thought to himself, “They will think you are dead and leave, just don’t move a muscle”. “I am a stone, I am a sphinx made of stone and I won’t even move by an inch”. He repeated these words to himself constantly. He was still repeating those words when a mechanical claw caught him along with several of his dead comrades, and lifted them into the air towards the center of the necroprocessor. Jeri Hansen was the seventh child out of nine. A star pupil and she excelled at gymnastics too. She was the star flag twirler for her college gymnastic team, no one could match her grace and cat like reflexes. But that afternoon at the colony stadium everything was so fast not even she could react. She was struck by some kind of stunning beam and fell immediately to the ground. 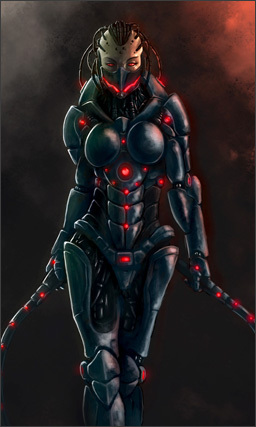 A blurred shape was before her, as her eyes began to focus she saw a mechanical body looking down at her with eyes glowing red. Once Jeri was fully awake and aware she realized everybody surrounding her was dead. Thousands of them. But she wasn’t prepared for the pain that followed. Alexander was becoming familiar with his new implants, his head was burning and something resonated strongly in his brain. He closed his eyes and concentrated on the annoying interior noise. Soon he realized that this buzzing was not a consequence of what they had done to him. It was code. Thousands of lines that could he could now read. Orders delivered directly into his mind that repeated again and again. All of a sudden the sequence of commands changed. Alexander could not believe what he was seeing. However something interrupted his thoughts. Two huge insectoid robots turned to look at him. The orders in his brain had suddenly changed. It was the only thing he needed to say. 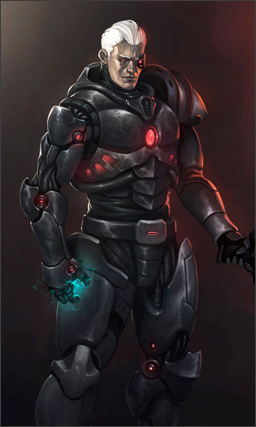 The Harvesters have cheap troops that don’t excel at anything, however they can become fearless with the Cybermasters and carry dread weapons to pin down or abduct enemies. They are bad at generating command points, but they can harvest it instead from dead enemies or revive their fallen troops.